This is a great salad to make while entertaining since it's so easy to make huge batches of. I rarely make non-savory shrimp dishes (and salads), so it's refreshing making something new. This salad is basically shrimp with a converted tartar sauce. I will definitely make it again when I have the time. Fill a medium saucepan with water and bring it to a boil. Add the lemon, a tablespoon of salt, and the shrimp and reduce heat to medium. Cook for approximately 3 minutes then put the shrimp in a bowl of cold water. Peel the shrimp and set aside. 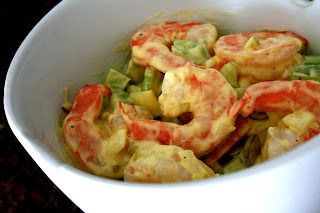 Stir together the mayonnaise, mustard, vinegar, salt, pepper, and dill then combine with the shrimp. Add the onion and celery and taste. You're free to add anything extra (I added more pickles because I like the flavor). Done!